The senior population is growing exponentially as the Baby Boomer generation moves into retirement. That means changes for pharmacies, but it also means significant opportunities. One thing that helps is keeping seniors top of mind in your marketing, outreach, and retention efforts. At its most effective, a pharmacy thrives when it builds effective relationships; those relationships, in turn, retain patients and grow business through referrals. However, our customer relationships aren’t the only ones upon which we need to focus; preferred pharmacy networks, especially those taking Medicare and Medicare Part D, should also be on your radar if you’re not already a member of one. Convenience is key for many health care shoppers. If you’re not positioned to offer a one-stop experience that encompasses education, benefits reviews, or even walk-in vaccinations and clinical services, you’re likely to lose business to pharmacies that have taken the time to plan for and implement these services. Whether you’re guiding someone through the intricacies of their PPO or their open enrollment for benefits, providing seminars on holistic medicine or preventive care, or fielding a call from a long-time customer whose child has a high fever, you’re providing something more than a service; you’re creating a “sticky” experience that encourages loyalty. Artificial intelligence (AI) is only beginning to realize its potential to upend every segment of healthcare, and the technology still hasn’t reached a scale or price point that it’s within reach of the average independent pharmacy. That doesn’t mean you cannot still take advantage. That technology exists, albeit at a slight remove, in many of the systems you may already be using, from pharmacy management software to your POS. Leveraging data requires creativity and consistency, but can help you improve everything from your pharmacy workflow to patient outcomes. Of course, these opportunities come with a caveat: like any other data-intensive industry, pharmacies must exercise extreme care in the management and security of patient data. The reasons for this go beyond HIPAA compliance to include the safety of our patients and forestalling severe damage to our own reputations in the event of a data breach or leak. Resilience has long been the province of academics and urban planners, but extreme weather events in recent years have made it a key concern for business owners as much as theoreticians. Broadly speaking, it’s your ability to respond to a catastrophic event and get back on your feet quickly. For pharmacies, that means thinking of things that aren’t normally far up on our list of priorities. It can mean the ability to respond to events that take place far from home, disrupting supply chains and drug availability as much as any physical impact on our locations and their contents. However, it also means the ability to anticipate and respond to other things — market downturns, shifts in demand, a rapidly-shifting retail environment — that may not be catastrophic, as such, but that are no less disruptive for that. 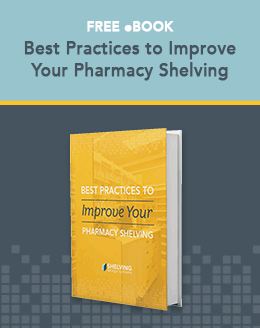 Supply chain transparency, maintaining proper stock levels, and airtight inventory management all have a part to play in keeping your pharmacy ready come what may. Pop-up shops, once a novelty and now the bane of some folks’ existence, still have something to teach pharmacists. Your store layout, pharmacy decor, shelving, merchandising, and your product mix are all key elements in how your patients and customers interact with your brand. Finding ways to ensure that those interactions are memorable doesn’t mean a gimmicky area set aside for selfies. However, it does help to remember that each person who interacts with you and your staff are looking for something more than a filled prescription and a package of cough drops. What ties all of this together? The better your design — both on your sales floor and behind the counter — the more time you can devote to building an experience that means something. That doesn’t take a futurist, just a designer with experience. Ready for Shelving Design Systems? Call us.